The Joint Services Flag is a vertical tricolour with a plain black badge. The badge is that of the Ministry of Defence - it is formed within a circle and consists of an anchor (symbolizing the Royal Navy). with two crossed swords for the Army and a pair of wings representing the Royal Air Force all ensigned by a St Edward's Crown. There are several flags and one pennant relating to the Joint Services (Secretary of State for Defence and Joint Commander in Chief, etc. ), and they are all based on the dark blue, red and light blue tricolour (although largely horizontal rather than vertical), however, the details vary dependent on the rank involved. As examples, the flag of the Secretary of State for Defence is a horizontal tricolour with a St Edward's Crown in full colour its centre crested by a gold lion passant guardant, whilst that of the Joint Commander in Chief is (again) a horizontal tricolour but with a Union Jack canton, and the Joint Services badge in full colour, surrounded by a gold wreath and ensigned by a crown (also in full colour) in the centre of the fly half. 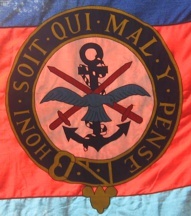 The British chief of defence staff flag was a development of the 1956 car flag of the Chairman of the Chiefs of Staff Committee, whose name was changed to Chief of Defence Staff in 1959. The flag then was a horizontal tricolour, dark blue (Navy) over red (Army) over pale blue (Air Force) with proportions of 1 x 2. The badge in the centre had a white and blue eagle, two crossed red swords, and a dark blue foul anchor on a white disc encircled by yellow laurel leaves, surmounted by a royal crown in colour. The badge, known as the 'unified device', appears to have been a refined version of the Combined Operations Headquarters badge introduced in 1940. That had an eagle, a clear stockless anchor, and a sub-machine gun, all in red on a blue circle. On 4 August 1965 the Chief of Defence Staff proposed that his flag should be changed and suggested the new Chief of Defence Staff badge in gold in the centre of the Union Flag. The new badge was an oval version of the unified device encircled by a garter and surmounted by a crown. The idea was submitted to the College of Arms. Garter King of Arms, Sir Anthony Wagner, did not approve. He wrote that it was bad heraldry to deface the Union Flag. The only exceptions should be Queen's and Regimental Colours. Any defaced Union already in existence (e.g., Chief of the Imperial General Staff flag) had not been sanctioned by the College of Arms and in strict sense was illegal. Additionally defaced Union Flags were not sufficiently distinctive and could be confused. He suggested Chief of Defence Staff badge on a white flag, or some other plain colour. Other suggestions were flags with a Union canton and the Chief of Defence Staff badge in the fly. Red, white, blue and six striped flags were rejected in favour of what was essentially the 1956 flag with a Union canton and revised badge moved into the fly. The draft warrant 12 October 1965 states "Argent an Anchor Azure with a Cable Azure and Argent surmounted by two Swords in saltire Gules over all an Eagle volant affronty the head lowered and to the sinister of Royal Air Force the whole encircled by the Garter ensigned by the Royal Crown proper." Flag. "Tierced fessewise of Royal Navy Blue, Gules and Royal Air Force Blue a canton of the Union." Sources: Public Record Office document DEFE 24/178, Carr (1961), and Cole's 'Heraldry in War'. Sir Anthony's position that defaced union jacks were illegal (and bad heraldry) seems a bit quixotic considering the number of defaced union jacks that had been approved (by the Admiralty, I guess?) as governors' and diplomats' flags. In the letter I think he had only army flags in mind. All the diplomatic, consular and gubernatorial defaced union jacks were covered by an Order in Council of 7 August 1869. The CIGS flag he quotes was not covered by it. General Officers Commanding, when afloat, have a properly authorised union jack with the royal cypher and crown on a blue disc surrounded by a laurel leaf garland, but the car flag of the Chief of the (Imperial) General Staff, royal crest on a union jack, was, from an heraldic point of view, possibly adopted without official authorisation. A flag for the Chairman of the Chiefs of Staff Committee was first approved towards the end of 1956 (H. Gresham Carr, Flags of the World, 1961, p. 133) - this was a horizontal tricolour of dark blue (Royal Navy) over red (Army) over air force (light) blue (Royal Air Force) - the order of seniority of the services - with the joint services badge overall. Originally the white circular background of the badge was surrounded by a gold cordon. Admiral of the Fleet the Earl Mountbatten of Burma became the first Chairman. Three years later his title, and that of the flag was changed to Chief of the Defence Staff. The garter that is currently used was added when Lord Mountbatten was appointed Chief of the Defence Staff in 1965. I managed to obtain a somewhat different UK Joint Service flag recently and have been trying to positively identify it, but have not succeed so thus I ask for everyone's opinion. My flag looks to be a combination of the Chief of the Defence Staff flag and the Unified Commander (2 Star) flag. The order of the garter should not be present in the Unified Commander's flag, but on the other hand if it is supposed to be the Chief of the Defence Staff flag, it is missing the Royal Crown as well as the fact that the motto is round and not oblong. It is marked 12'x6' (1988) Porter Bros Liverpool and then H8 8345-99 541 9771. I first thought it was a case of an error. Perhaps some one at Porter Bros got the two flags mixed up and discarded this one, but after having spoken to the lady that sold it to me, she says she has another identical one, only this one is marked 1986! What is the likelihood they made the same mistake, but two years later? It has to be the UK Chief of the Defence Staff or very closely related to it, as speculated by Mattias Hansson when he originally submitted this. The HSQMYP motto is always called "the garter" (from the Order of the Garter). According to our identification of the Joint services flag and the Chief of Defence Staff flag, the Garter was added when Lord Louis Mountbatten was appointed CDS in 1965. The Garter (either round or in an elongated oblong) is only used in British iconography when there is an authorised royal connection. Mountbatten was a great-grandson of Queen Victoria, uncle of Prince Philip consort of the current Queen, last Viceroy of India and its first Governor General, and Chief of Combined Operations in 1941-43. From the latter to CDS, Mountbatten twice embodied the joint services ethos. The Garter in the mystery flags is a very important clue closely tying this to the CDS. The first question I suppose is whether Graham Bartram's illustration of the CDS flag is absolutely correct and unchanged since 1965. Purely speculative on my part, but could the mystery flags be the Vice CDS or one of the Deputy CDS (currently three in number)? Note that these posts are separate from the Chiefs of the three services. The "stars" mentioned refer to the ranks of the officers concerned, and are based upon two things, a) that US General Officers wear stars on their shoulder straps as a mark of rank, and b) (almost certainly following US practice) British General Officers (whilst they don't wear them on their shoulder straps) have stars on their car rank plates (although with six rather than five points on each). A full general (in both services) has four stars, a Lt General three, a Major General two and a Brigadier (a Brigadier General in US Service and several others) one. US and UK rank insignia aren't alike at all, but my recollection was that beginning during the first Gulf War, UK generals working in joint environments would wear US-style stars on the front of their uniforms for easier identification by non-UK personnel. And the reason for referring to these flags by the number of stars instead of the rank title is that these are joint forces, so the commander could be of any of the British services and therefore bear any one of three different rank titles. For instance, the three-star commander's flag might be flown by a vice admiral, a lieutenant general, or an air marshal. Saying "three star" is just a convenient shorthand, and less esoteric than using the NATO standard rank code "OF-8." The Flag Institute Library is in the process of taking delivery of the Ministry of Defence's official pattern flags, amongst which just happens to be an MOD Police flag, so I provide a photo here. Senior Officer Car pennants in WW1 were all rectangular, in the proportions 3:5. There were no actual regulations about size, other than to say 'small' - the ones I have seen in museums look to be about nine inches x fifteen inches (23 cm x 38 cm approx.). Having said that, senior naval officers serving at GHQ (the Principal Naval Transport Officer France was entitled to a rear-admiral's flag) may have used a flag in the naval proportions of 2:3. Liaison Officers serving at Allied HQs were entitled to a Red Ensign and this may have been in the conventional proportions of 1:2.